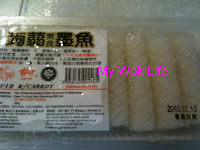 I bought the vegetarian squid slices which packaged into a nice plastic box. With the cross pattern on one side of the mock squid, it looks almost similar to the real squid slices. Beautiful flowery slices when cooked, these mock squids were made from a super low caloric and highly nutritious plant, and this jelly-like health food is called Konjac, in Chinese, 蒟蒻 (Pronounced as: Jǔ Ruò). I got the Konjac-squids from NTUC Fairprice (*Chilled compartment where you may find fish balls related products). Let’s know more about Konjac food. Maybe you will be more familiar with the Japanese term, Konnyaku. Nay~ Konnyaku jelly.. Yes~ it’s the same product. Konnyaku consisting of Konjac is widely used in Japanese and Korean food products, now even Chinese vegetarian food. Konjac health food benefits our body a lot which includes normalizing cholesterol level, prevent high blood pressure, rich in minerals and dietary fiber, etc. As I mentioned previously, it’s surprisingly low in calorie with almost no fat in it. Hence, eating these vegetarian squids literally having much opposite effects of eating the real squids. But I can tell you, the texture and mouthfeel of biting the Konjac-squids are almost similar to the real one, and in fact, the vegetarian ones are more bouncy to bite than the meaty-squids. Diet watcher, feel ease for having more of the ‘squid’ now! Smile.. But, but.. This is for my vegetarian day, even sambal chilli has to be vegatarian product. 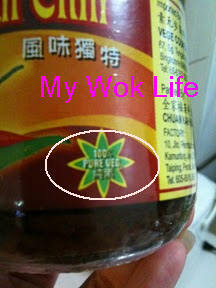 I got the bottle from a vegetarian shop which sells cooked vegetarian food and also the raw packets for home cooking. 1) Heat wok with oil over medium fire. Add sambal chilli paste (*Beware of sizzling chilli, lower heat if necessary). Stir fry chilli paste with spatula till fragrant. 2) Add vegetarian squids (*You may return to medium heat if lowered it previously). Add water and stir fry for few seconds. Now, lower heat to low fire again. Add tomato. Then, cover wok with lid to simmer for 3 minutes. 3) Remove lid and increase heat to medium – high fire. Sprinkle salt and sugar. Stir fry for few seconds to combine well. Heat off and dish up. Serve with steamy hot white rice. 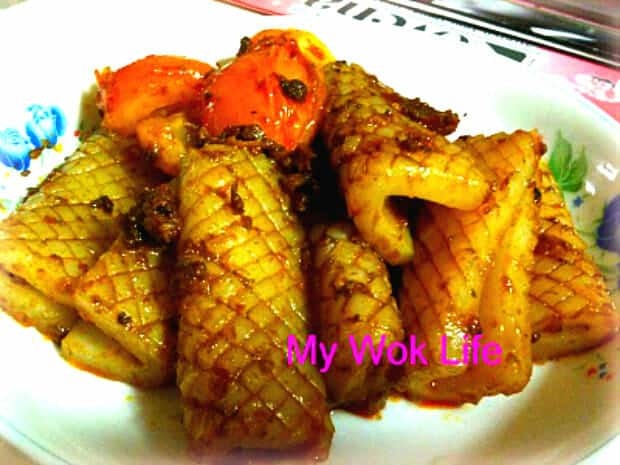 A generous portion of my spicy vegetarian mock squids counts about 160kcal. Tips: Adjust the amount of chilli paste to your preference of spiciness. 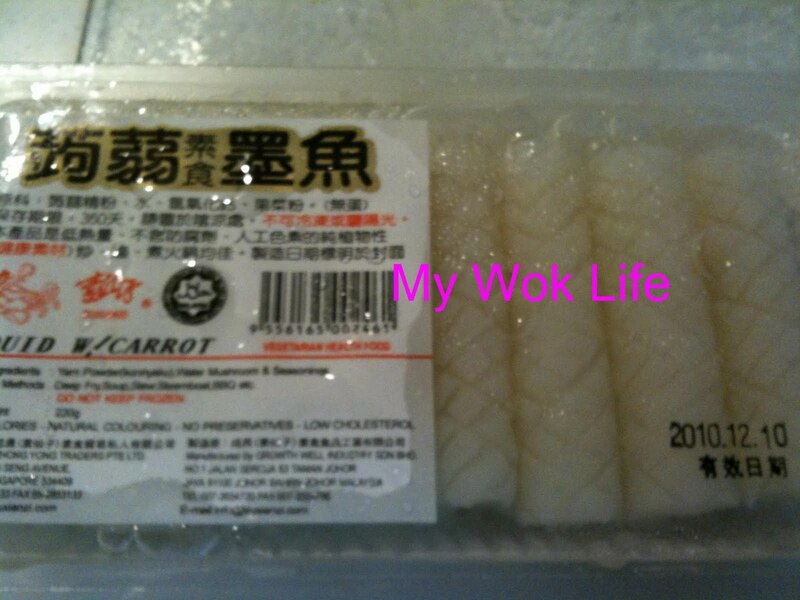 * A box of this vegetarian squid slices costs about S$3 – $4. * A bottle of vegetarian sambal chili costs about S$3+. May i know which vegetarian shop that you got the vegetarian sambal chilli from? I couldn’t recall which exact store, but understand that supermarkets do sell it. There is also this vegetarian shop, Zi Zai Vegetarian at 801, Tampines Ave 4, sells some sambal chili pastes.